Members of the Larchmont Historical Fire Company Donny Keck, Ned Benton, PJ Abrahamsen and Jim Sweeney (l-r) serenade their Hose Company guests with a firefighting ditty. 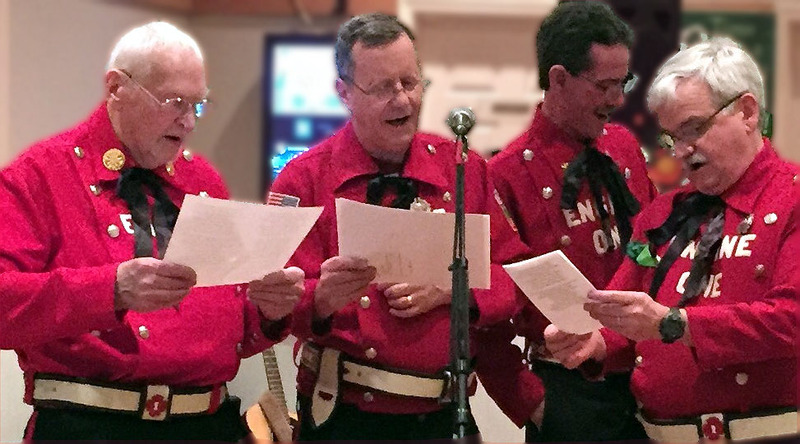 On March 2, 2019 beginning at 7:00 pm, the Larchmont Historical Fire Company – a committee of the Larchmont Historical Society – will host its traditional Irish Night celebration at the American Legion Hall in Flint Park, Larchmont, NY. This year Irish Night will be prohibition-style – a 1922 Speak-Easy – including a 1920s home style wine tasting. Get Your Tickets Now: The party is open to all: tickets are $50, with discounts for members of the LHS, veterans and fire companies. Click to purchase tickets. Prohibition-Style Speak-Easy: For 2019, our Irish Night will be celebrated as it was in 1922 during Prohibition. Participants are warned – there may be a raid by the Revenue Agents, but everyone will be issued an “alibi packet” that, if it works like it did in the 1920s, will protect you from arrest. Irish Dancers: There will be a show of traditional Irish dancing. Music by Al Craven and Bob Kenison, the duo known as Those Weasels: They, will feature Irish tunes and sets of Golden Oldies from the 1920s, 1950s, 1960s and beyond. Prohibition-Style Basement-Made Wine and Firefighter Craft Beers to be Sampled: In addition to traditional fare, music and raffles, Irish Night will feature a tasting of craft beers, including those brewed with firefighters in mind. Also available for sampling will be the Historical Fire Company’s prohibition-style basement-made wine. 1891 Extinguisher Cart to Appear: Also making an appearance will be members of the Historical Fire Company in their parade uniforms and illuminated helmets along with the 1891 Fire Extinguisher Cart which they pull in parades..
← Help Us Meet a $4,000 Challenge Grant To Keep Our Wheels Rolling!